A collection of papers from the <a href="[external URL] target="BLANK">TMS 2009 Annual Meeting & Exhibition held in San Francisco, California, February 15–19, 2009. 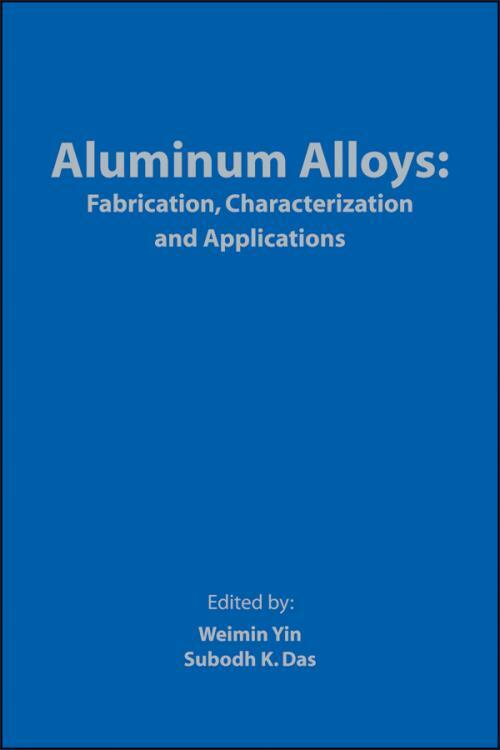 Aluminum Alloys: Fabrication, Characterization and Applications. Development of Al–30%B4C Metal Matrix Composites for Neutron Absorber Material (X.–Grant Chen, and Robert Hark). Enabling Environmentally–Informed Materials Selection Decisions: Robustness of Early Stage Life–Cycle Assessment (Anna Allen, Subodh Das, Frank Field, Jeremy Gregory, and Randolph Kirchain). Effects of Heat Treating Aluminum Alloy 6061 in 8 T and 20 T Magnetic Fields (Samuel Adedokun, Akin Fashanu, and Bayo Ogunmola). The Correlation between Deformation Conditions and Peripheral Coarse Grain Structure in Extrusion of AA7020 Aluminum Alloy (Ali Eivani, Hany Ahmed, Jie Zhou, and Jureg Duszczyk). An Investigation of the Hot Deformation Behavior of AA7020 and AA7475 Aluminum Alloys (Hany Ahmed, Ali Eivani, Jie Zhou, and Jurek Duszczyk). Influence of Stress Macroconcentrators on the Strain Localization in Al6061/Al2O3 Composites (Y. Deryugin, V. Panin, V. Suvorov, Galina Lasko, and S. Schmauder). Press Formability of Twin Roll Cast (TRC) Aluminum Alloys (Sooho Kim, and Anil K. Sachdev). Forging of Long Flat Pieces of Aluminium with a Precise Mass Distribution Operation (Malte Stonis, Michael Lueke, and Rouven Nickel). Hemispherical Bubbles Growth on Electrochemically Charged Aluminum with Hydrogen (Paul Rozenak). Ablation Casting (John R. Grassi, John Campbell, M. Hartlieb, and F. Major). Strength–Toughness Optimization Scenarios through Interrupted Ageing in AA6061 and AA2024 (Doty Risanti, Pedro Rivera–Diaz–del–Castillo, and Sybrand van der Zwaag). Preparation of Al–Sr Alloys with High Concentration by Molten Salt Electrolysis (Jidong Li, Mingjie Zhang, Tingan Zhang, and Dan Li). Preparation of Al–Li Alloys by Molten Salts Electrolysis (Jidong Li, Mingjie Zhang, Tingan Zhang, and Dan Li). Preparation of Al–Sc Alloys by Molten Salts Electrolysis (XiuJing Zhai, Mingjie Zhang, Junfu Li, and Yan Fu). Aluminum Plate Hot Rolling Process Modeling (Zhengdong Long, Yansheng Liu, Randall Bowers, Weimin Yin, and Shridas Ningileri). Effect of Asymmetric Rolling on Texture and Anisotropy of AA6016 Alloy for Automotive Applications (J. Sidor, L. Zhuang, M. van der Winden, and L. Kestens). The Residual Stress Investigation in Al Using ß–Particles Penetration Method (Behrooz Salehpour, H. Pirhoseinloo, and M. Taheri Hashjin). Numerical Simulations of a New Local Hot Forming Process for Making Imprints in Aluminium Extrusions (Hallvard Fjær, and Børge Bjørneklett). Simulation of PLC–Effects in Al6061/Al2O3 Alloys (Galina Lasko, Ye. Ye. Deryugin, and S. Schmauder). Formation of Special Textures by Precipitation in Cast AA5083 and AA3004 Aluminum Alloys (Qiang Zeng, Xiyu Wen, and Tony Zhai). Effect of Alloying Elements on the Segregation of Complex Phases in A356 Alloy Adding Mg, Cu, Ni and Sr as Modifier, Using Thermal Analysis and Characterization Microstructural (Aline Hernandez–Garcia, Alejandro García–Hinojosa, F.T. Estéves Alcázar, and Yvan Houbaert). Effect of Si Distribution on the Fracture Toughness of A356 Aluminum Alloys (Yong Nam Kwon, Kyuhong Lee, and Sunghak Lee). Effect of Weld Tool on Friction Stir Welded AA2219–T87 Properties (Joseph Querin, and Judy Schneider). The Corrosion Behavior of Al–Zn Alloys in Abakaliki and Port Harcourt Rainwater (Ndubuisi Idenyi, C. E. Okeke, and Israel O. Owate). The Effect of Mn as Fe Corrector on Microstructure and Adhesive Wear of Eutectic Al–Si Piston Alloy (Dheerendra Dwivedi, Mohit Dhiman, R. Sehgal, and I.K. Bhat). Comparative Analysis of the Corrosion Susceptibility of Al–Zn Alloys in De–Ionized Water, Rainwater and Seawater (Ndubuisi Idenyi, C. E. Okeke, Israel O. Owate, and S. I. Neife). Influence of Aging Time of Fracture Toughness Mechanisms of Al–Li Alloys (Yongxin Wang, Ri Ma, Zheng Chen, and Yanli Lu). The Effect of Heat Treatment on the Microstructure and Hardness of A356 Aluminum Alloy (M. Faraji, and L. Katgerman). Development of High–Strength Hypereutectic Al–Si Alloys by Nano–Refining the Constituent Si Phases (Mohammad Shamsuzzoha, Frank R. Juretzko, and Anwarul Haque). Fabrication of Aluminum Composites with Gradient Cladding Interface by Continuous Casting (Weiwen Zhang, Datong Zhang, and Yuanyuan Li). Influence of Magnesium and Silicon Content on Microstructures of In–Situ Mg2Si/Al–Si Composites (Qingxiu Jing, and Yinglu Zhu). Foam Structure and Mechanical Properties of AlCu5Mn Foam (Zhuokun Cao, Bing Li, Guangchun Yao, and Yihan Liu). Viscosity Control of Foam Aluminum Melt and Study on Bubble′s Stability (Li Wei, Li Cao, and Shumei Li). Effects of Complex Modification and Melt Mixing Treatment on Microstructures in In–Situ Mg2Si/Al–Si Composite (Jing Qingxiu, and Huang Xiaodong). Study on Sound Insulation Performance of Al Foam Sandwich Board (Guoyin Zu, Guangchun Yao, and Hong Li). Effect of Cold–Rolling Bonding Process on Microstructure and Properties of the Sandwich Aluminum Foil for Automobile Heat Exchanger (Guoyin Zu, Ning Wang, and Jiuming Yu). Study on Powder Metallurgy Foaming Process of Rolled Precursor (Guoyin Zu, Guangchun Yao, Hong Li, and Liang Hao).